Eat, Drink, Read, Repeat: Have You Been To Andheri's Leaping Windows Yet? A cozy nook, a book in your hand, and some piping hot coffee to sip on. Are you already tempted by how comfy this sounds? Then you must head to the Leaping Windows Cafe in Versova if you still haven't. There's some really good spread of food, fun vibes, and awesome-sauce ambiance. Leaping Windows is a gorgeous cafe which is spread across two floors and a cosy little basement. The ground and first floor houses quirky comic strips painted on all their walls. Yet, the beauty of the place lies in its basement. It has a tiny reading room with pin drop silence (quite literally) and stands full of every comic book you can possibly think of. From DC and Marvel to Tintin and Tinkle, their collection is massive. The reading room charges are minimal compared to what they have to offer. So if you're a comic book fan, you know where to head to. And the menu is a mix of continental, European and american munchies. If you're there, do not miss out on their Bannoffee Pies, and Cajun Burgers. 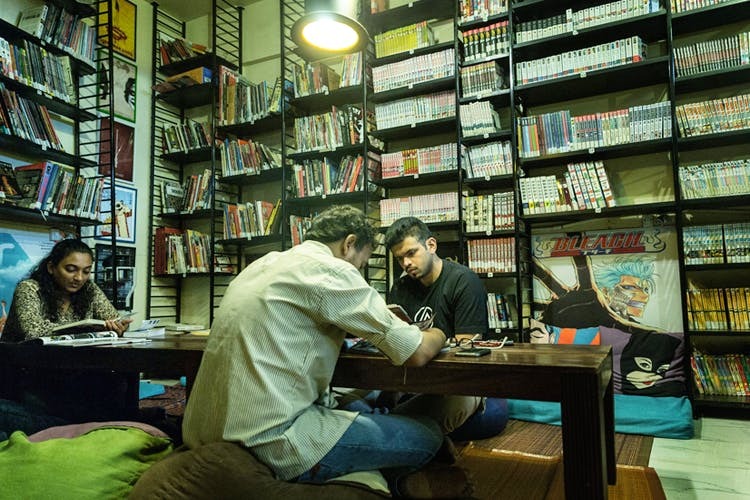 The next time you’re in Versova, don’t forget to hop into this place to have some super crunchy hot potato wedges and then sit down to read your favorite comic book! Leaping Windows Is Selling The Most Amazing Bacon-Loaded Pancakes!